Today I actually started my marathon training in earnest. I need to up my time and distance. I cannot rely on fortnightly races to get me ready for the BMW Berlin Marathon on the 29th September. Before today the longest I have run, in terms of time, was the jet-lagged, water-logged, NASCAR track North Carolina half marathon that I ran in Charlotte. 2 hours and 24 minutes. The furthest I had ever run was 13:3 miles for an expertly measured half with no corners cut. 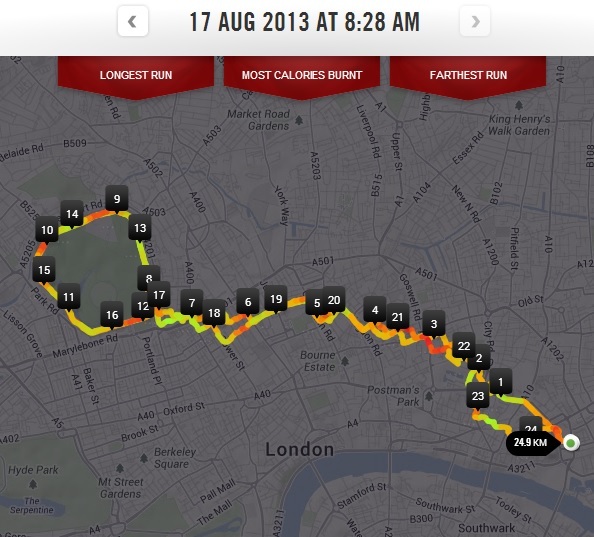 After running the London Summer 10K last week I noticed that the run to (and from) Regents Park was about 8-9K. So, running there and back is pretty close to a half marathon. That is a good start, but I need to be running 30K. I then, when writing the last post, discovered this…. and it changed my marathon training completely. 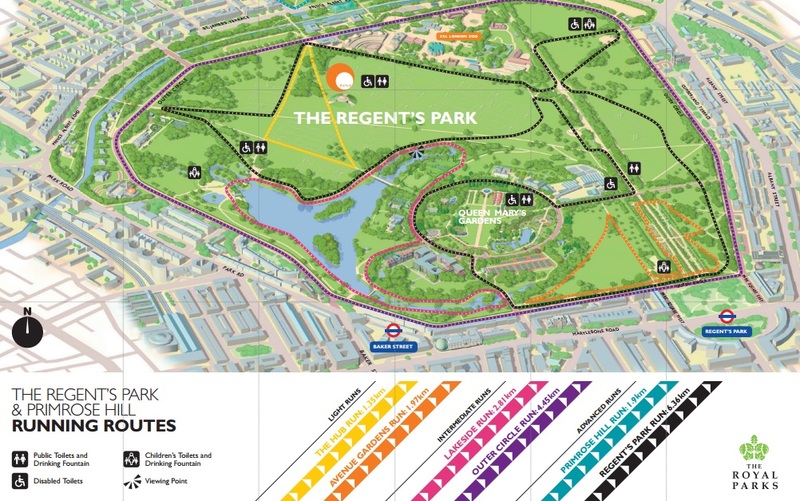 This means that I can run to Regents Park, do as many of the Outer Circle 4.45KM loops as I like, and then run back. Today, the day I decided to run the farthest and for the longest time ever, I decided to run two loops. My right shin hurt when I started and I thought, as I always do when I run, that I am not going to make the end.I persevered through, and less than an hour in I was at the south east corner of the park. I paused then started on my loops and, do you know what? It bloody worked. I like to know my route. I do not want to get lost, and end up having to work out how to get home. So this is absolutely perfect for me. All I need to do is add more loops and blam, I am done and ready for Berlin. Berlin will be 42.2 kilometers. As I said before, the most I have run is 21.1, or 13.3 miles. 24.9KM or 15.5 Miles. A NEW PERSONAL Record. In 3 hours 11 minutes. A NEW PERSONAL Record. I get that this is slow, but speed was not on the cards today. This was to go further and for longer. And, better still, I know I could have added another 5 miles on today. Walk/run/job, I don’t care. So this time would have made it a 5 and a half hour marathon, next time I can go faster, or for longer. I have the THAMES MEANDER half marathon next weekend, then a break of two weeks before RICHMOND 10 or BACCHUS, then LONDON ZOO 10K. I am going to run 20 miles in one go, or at least 18. This is the new challenge for me. Speed I can work on at Primrose Hill, or the running track at Regents Park. That is for another time. Today, I have this to be proud of. All you have to go is keep going. Sooner or later you will reach the finish line. On a second note re the PALEO diet and how it is going. I am 76.1KG I have not been under 76 for as long as I can remember. If I dip below it (unlikely given my post PR splurge today) I will be ecstatic. I think this works so well because it is the natural way of eating. So many people are gluten intolerant now or lactose intolerant. Cutting out those foods is the way to go. And why are people so allergic to those foods? Because it is only recently we domesticated cows for dairy. It is only recently (relatively speaking) that we learned to process crops in such a way. In short, our digestive system hasn’t evolved at the same pace as the food industry, and it is never going to catch up. Not in a million years. I was google'ing about Greenwich race as I am taking part in it (wanted to find out how many people used to take part in previous years) on November 30th and found your blog. And later found out you are Paleo! Wohoo! Good reading! Thanks for sharing!